All this talk about Russia as the aggressor and NEVER one shred of evidence. With all the lies about Iraq and their non-existent weapons of mass destruction, to 9-11 and the government’s explanation of events that contradicts the laws of physics, when are we going to stop listening to accusations and demand hard proof? 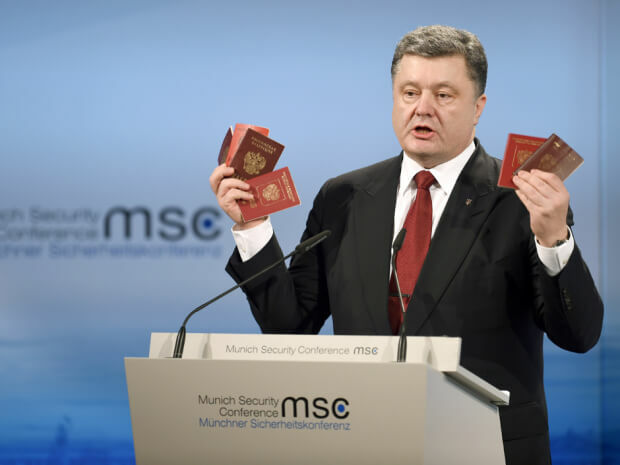 Recently, Poroshenko held up Russian passports that he claims PROVES the Russian military is invading Ukraine. Even if you didn’t know that active military personnel in Russia don’t have passports, only special military ID, Ukraine refused to give Russia a copy of those passports to check. I guess the idea was, believe my words but there’s no way I’ll let you check me. Can you think of any good reason Russia couldn’t have a copy? Russia hasn’t broken any treaties or agreements. That honor belongs to NATO and the USA. Russia did honor a referendum in Crimea in 2014, just like Britain honored a referendum in March 2013 in the Falkland Islands. In the meantime, America will continue dropping bombs on other countries and Russia will continue signing multi-billion dollar trade deals around the world. This entry was posted in News & Views on February 12, 2015 by RomanInUkraine.